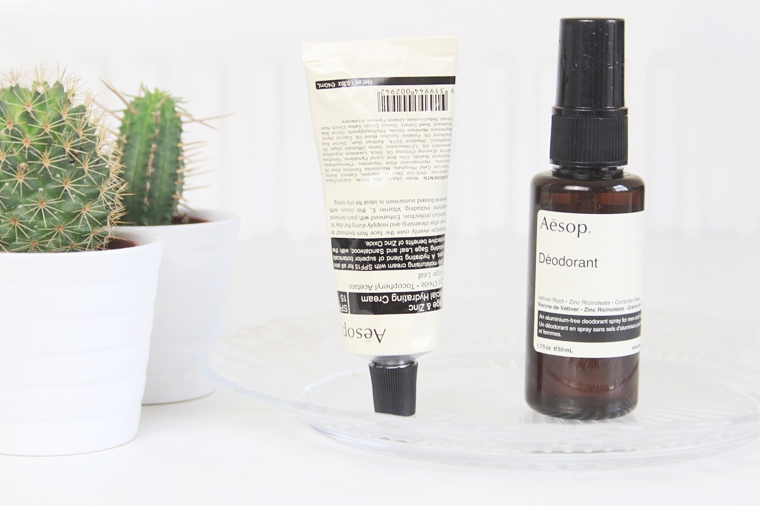 Aesop have become the skincare brand that I've been most excited about lately, I've finally got to that age where simplistic packaging and natural ingredients within products pleases me. For the last few weeks I've been trying out the Safe & Zinc Facial Hydrating Cream which I've subsequently become a huge fan of, it instantly perks up my skin and sorts out any dry areas without feeling at all heavy on the skin. It sinks in straight away also making the perfect base for foundation, plus it has built in SPF15. The packaging is great too, with it being a small sized metal tube it doesn't take up much space in my make up bag and is kept hygienic, it also ensures that you get to use up every drop of product. If you're wise to product ingredients then you will know about the controversy surrounding aluminium in deodorants, if not then feel free to give it a quick google search. Personally I don't tend to worry about that kind of stuff too much but for those of you who do it's worth checking out this natural alternative. I was pleasantly surprised to find that it worked much better than I ever thought it would, I found it controlled perspiration and kept me smelling fresh, you only need one or two sprays under each arm so I'd imagine the bottle would last a few months. The scent is ever so subtly masculine which I love. It also leaves zero sticky residue and sinks instantly into the skin and for that reason feels much nicer than applying a cream or aerosol deodorant and feels as though the skin is still left to breathe. I've also noticed that the skin under my arms feels much softer than usual which must be down to not using harsh chemicals which dry out my skin. That being said I still wouldn't ever spend anywhere over £10 on a deodorant, even if it was all natural and had no nasties in the ingredients. If you have the funds though I would recommend giving it a go, it's been a big surprise to me that a natural deodorant actually works. The skin under my arms needs some serious TLC too, and this sounds ideal the solution.